How this led to divorce he has no idea. 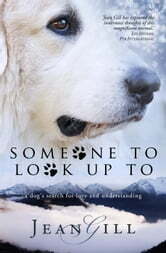 More misunderstandings take Sirius to Death Row in an animal shelter, as a so-called dangerous dog learning survival tricks from the other inmates. During the twilight barking, he is shocked to hear his brother's voice but the bitter-sweet reunion is short-lived. Doggedly, Sirius keeps the faith. An excellent story and quite different. A real tearjerker but heartwarming all the same. Jean is our author; Sirius is her Pyrenean Mountain Dog. So who is writing this book? Is Jean Sirius, or is Sirius Jean? This is a story written in a dog’s voice from a dog’s perspective. As told through all five senses, it captivates the reader from the very first sentence. Being a special pedigreed puppy growing up in the Pyrenees, Sirius teaches us what it means to be chosen by humans. He learns that what he wants is not always the way life evolves. Sirius tries to change human(s) behavior, but sadly, sometimes he is left alone in a place he has not chosen. After reading Gill’s wonderful, heartwarming story, I look at my dog with total new respect, and let her run as much of our lives as she chooses. I will be gifting Sirius’ story with friends. From a dog’s point of view. What an interesting read about life from a dog’s perspective. Really made me think and realize that everyone sees thinks from their own point of view. Some parts happy, some parts downright heart wrenching but such a good story! Gill's first hand narrative from Sirius' the Patou's (Great Pyrenees Dog) view re-affirms many beliefs I have held myself after being master to a one and a half year old Pyr named Sophie who had two previous masters. What we do, especially if we don't understand the nature and instincts of a particular breed can and do cause scars and behaviour problems. Gives a positive mention to Behaviourist Trainer Michael Hasbrouck. It is heartbreakingly realistic in its exposition of various toxic dog owners, what living in limbo in a S.P.A is like and what even some very reputable old world breeders can be like.